On publication day I was really pleased to feature debut author Jackie Baldwin as her first novel, featuring DI Frank Farrell, was published. You can read the Q&A she did with me here. I didn’t have time to read the book at the time but have now and it’s a terrific read. DI Frank Farrell returns to his hometown of Dumfries having worked for many years in Edinburgh. He’s no sooner back than the parish priest is murdered in his Church, in this quiet town which doesn’t usually see much by the way of serious crime. Soon after, twin boys are abducted and Frank begins to suspect there is a connection between the cases. Not only that, as the case goes on he begins to suspect that he too may be connected to the cases. You see, Frank is an ex-priest himself and used to attend this very church as an altar boy. The murder victim, Father Boyd, was responsible for Frank leaving the priesthood. In the past though, Frank has suffered from mental illness and he’s just not sure if he’s imagining the link and certainly some of his colleagues are wondering about his health again. In DI Frank Farrell, Jackie Baldwin has created a really complex and fascinating character. With his background as a priest he is very aware of the religious symbolism of the crimes. He seems to carry a lot of guilt, as I imagine that anyone who has left the priesthood would experience. He has a particularly difficult relationship with his mother who hasn’t forgiven him for leaving the priesthood. His complicated relationship with the Church has made it quite difficult for him to form romantic relationships. Although not a practising priest anymore, I think he still felt bound to some of the rules and this guilt affected him in many ways. DC Mhairi MacLeod is another great character. The other officers at the station didn’t think much of her but Frank sees something in her and puts trust in her. They develop a really great working relationship and she begins to blossom as a detective. She’s going to be an interesting character to follow in subsequent books and I think that she and Farrell are going to make a brilliant team. The book itself was a really gripping read. Short chapters moved the story along quickly. There were plenty of twists along the way to take me by surprise and the final few chapters in particular were very tense as the case comes to a climax. It is a very cleverly plotted book as strands of the story which seemed unconnected were gradually drawn together as Frank, began to suspect the motivation of the murderer. I thoroughly enjoyed getting to know DI Farrell and look forward to meeting him again in what looks to be a really promising new crime series. Thanks to the publishers for providing a review copy via Netgalley. 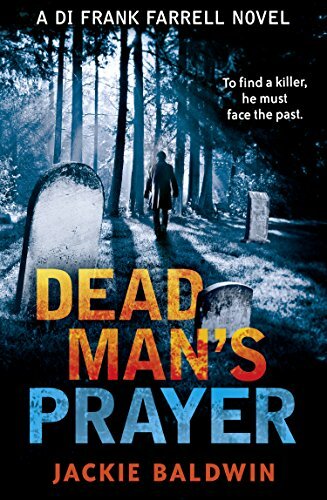 Dead Man’s Prayer was published as an e-book by Killer Reads on 2nd September 2016 and you can order a copy online here: Dead Man’s Prayer It’s currently only £1.99 so a real bargain for a great read.